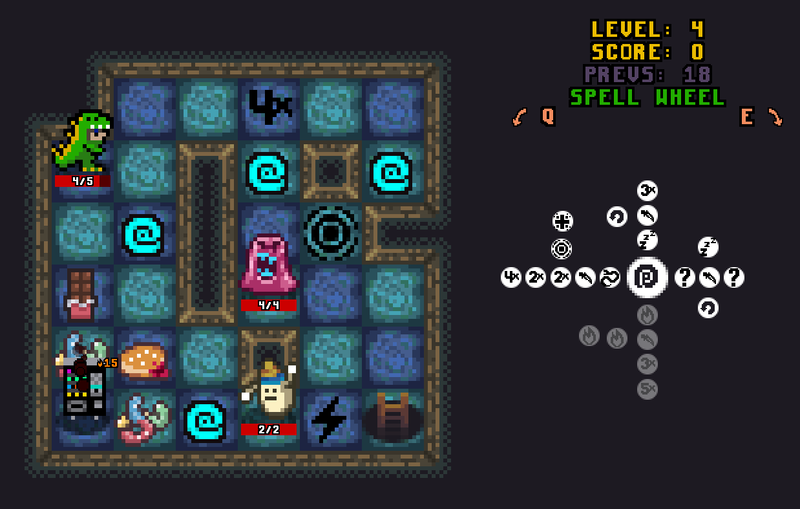 A wacky broughlike made for the Seven Day Roguelike Challenge of 2019. Synopsis: Take Emmysaurus through 6 levels of THE PEN and use your SPELL WHEEL to battle everything from Jellies to Milk Bottles. Run for the exit or try to get a high score. Your Spell Wheel has 4 spokes. Cast in one of the cardinal directions to activate one spoke. Each power on the spoke corresponds to a tile on the map itself and they are activated in order until hitting walls. Each power enhances the current spell and spells can branch into different paths, evolving independently. Vending Machines: You can attack vending machines to get candy. Candy heals you or gives score if you are already full health. When the vending machine produces a piece of candy, you'll have to try twice as hard to get the next one but technically there is no limit. Tips below, but they are spoilery! Fire: does 1 damage the first turn, but 1 extra each turn after. Power => number of turns. Rotate: spins the wheel clockwise or counterclockwise, one time per power block. Heart: makes an enemy friendly, if the spell has power at least equal to their HP. You don't have to pick up the spell powers. Each one will spawn a new monster. Remember that multipliers on the beginning of your spoke will have no effect since the spell starts out totally unpowered. Spin your wheel to skip a turn. The Reid family (Emmy, Nicole, and Rosie). Developed by Jeremiah Reid. You might add a prompt that tells you that you have to press space to start ... I spent some time clicking the nice swinging logo with nothing happening, trying this out in Firefox and Edge :D .
High score: 0. I'm terrible at this game -- it's more difficult than I usually like -- but I think the concept is really interesting. 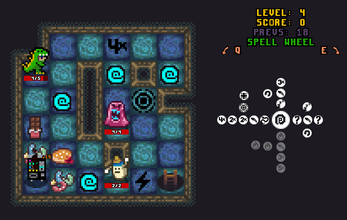 I wish it was easier at the start so I could get farther into the game to experiment more with different spell wheel configurations. Animation and graphics are really great. Hover tips on each spell power would be a great thing to add; I found myself constantly referencing the list down below and trying to interpret the icons (dagger = damage I assume?). The safest thing to do is run for the exit. Avoid picking new powers if you're in a weak position because they spawn monsters. Monsters also spawn if you stay for long enough. Very nice game design! The thing with the spell-wheel works quite well. This time I died on my third run in level 4 still with a score of 0. What do I have to do in order to obtain any points? You can get score from candy which comes out of vending machines, but only when you're already full health. Great game! My high score is 1 after 6 runs but i'm starting to get the hang of it.